In the 1000 piece, Friends in Autumn by White Mountain, a beautiful pasture side, Autumn illustration is depicted. 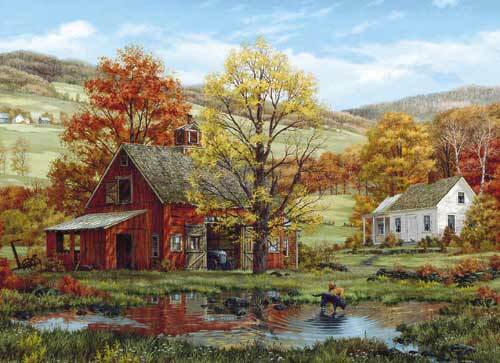 An old red barn is reflected in a pond where a pair of Labs wade, watched by a cat on the steps of a white farmhouse. Autumn leaves are so close to falling in this bucolic scene. This image is a beautiful scene that expresses peace and calamity. This puzzle is the perfect afternoon activity. White Mountain puzzles are one of our favourites. The pieces are of high quality, traditional shape, and fit together perfectly. 5 Stars Henry Sutter - Murphy . NC. This is another beautiful picture. Was wondering if you have a "puzzle club" Another pretty picture.